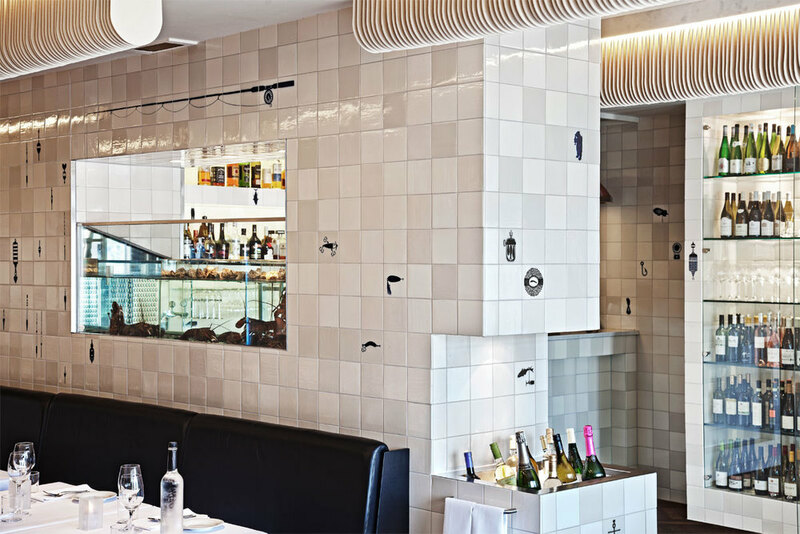 Restaurant Visaandeschelde opened its doors with a new interior designed by Studio Modijefsky and Studio Molen. The story of Visaandeschelde is told in different layers in the interior. When you enter the restaurant the first thing that catches your eye are the transparent icons hanging on the wall; a captain, a herring tub, a bear holding a freshly catched fish and a fish hook. These and more icons are coming back in the exclusively handmade and painted ceramic tiles from the Harlinger Tegel factory. The tiles consist of specially blended enamels, where a traditional blue colour is used for the illustrations. Even the leather curtains at the entrance are embroidered with ornaments. 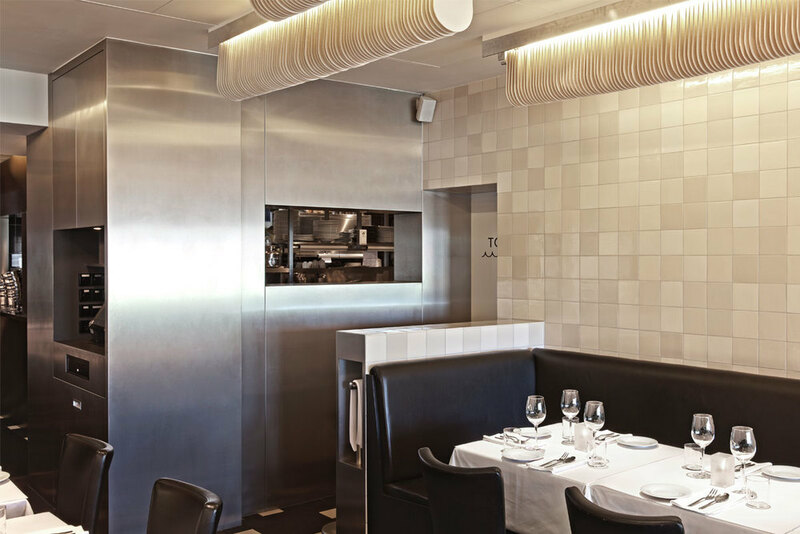 The herringbone pattern appears in a variety of materials such as metal, glass, ceramic and wood throughout the space; graphic expressions and special light fixtures compliment the food served in the restaurant. Antiquated Dutch craftsmanship techniques are applied in a new contemporary manner. Just like the courses of Visaandeschelde, the blend of old and new techniques, and beautiful materials led to a fascinating interior. The mix of materials, graphics and patterns create different areas in the restaurant each with their own unique atmosphere; such as the entrance, bar, kitchen and dining area. The lighting in the restaurant consists of pin-armatures with attached felt scales. Besides offering a beautiful sight, the scale strings filter light and create great acoustics. Above the bar, an impressive lamp adorns the ceiling. The 2,5-meter-wide light, is composed out of different ceramic ridges. Placed in a frame, the glazed ridges are decorated with a big painted cod. Big bright letters that you can already see from the outside reveal what the cuisine is all about: ‘VIS’ (FISH). The herringbone pattern of the wooden wall panels blend seamlessly with the mirror tiles of the adjoining wall. The floor in the bar has the same pattern which transcends straight into the handmade floor tiles behind the bar. The design for Visaandeschelde is an integral design. 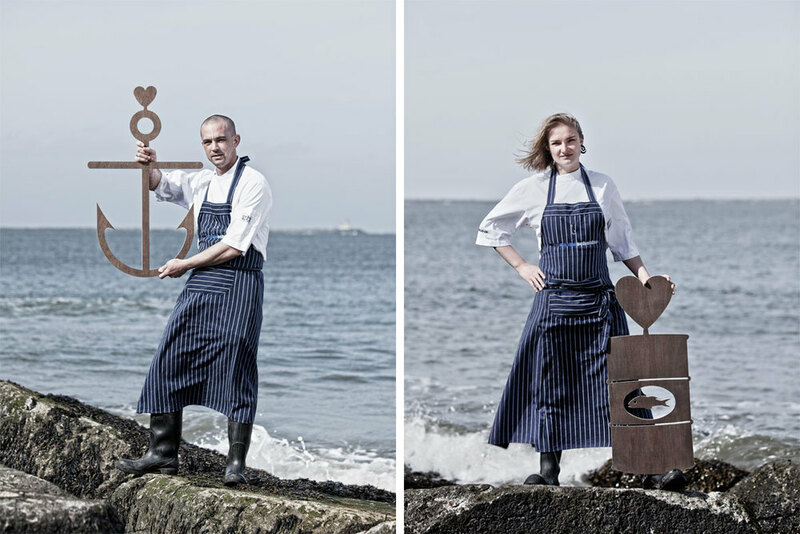 Besides the interior Studio Molen & Studio Modijefsky also developed a new identity, elaborating from the design of the table-cover, the business cards, and the website to a photo-reportage of the chef on the beach.